All Starport Bases Ship FREE! 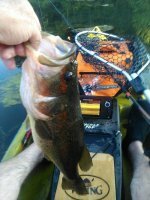 Kayak fishing is filled with excitement that non-kayakers can't fully grasp. We know first hand the thrill of the fight when hooking into a big fish from a small lightweight plastic boat. We have experienced the physical coordination and skill needed when handling a kayak in different water conditions. 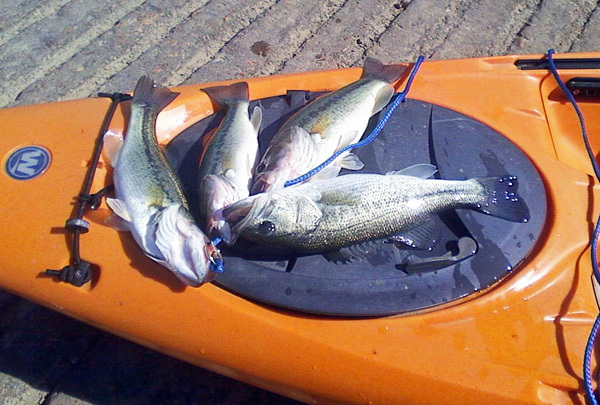 We have seen the advantage that stealthy kayaks offer when on the water and so much more. These are no longer just stories we tell. Now we capture them on video for everyone to see. The camera we use to video all of this is only half of the tools needed. You also need the perfect camera mount. One that is adjustable, sturdy, lightweight, and versatile. This describes the Railblaza Model 600 camera boom mount. The Railblaza kayak fishing mount model 600 is the most popular selling model. Top platform is removable and can be placed in a second base for low profile videoing. 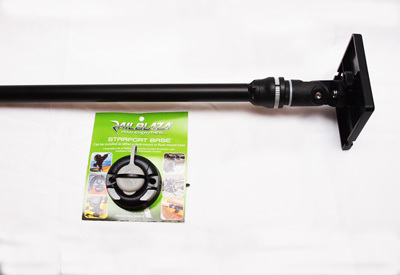 Hammerhead Kayak Supply now has Railblaza kayak fishing camera mounts Model 600 in stock. Because there are different types of bases, they are sold separately. Of all the camera mounts, the Railblaza model 600 rules above them. It is tall enough to get some great overhead shots and also is capable of swinging out in a complete 360 degree radius to capture video from an over the water angle or profile view. 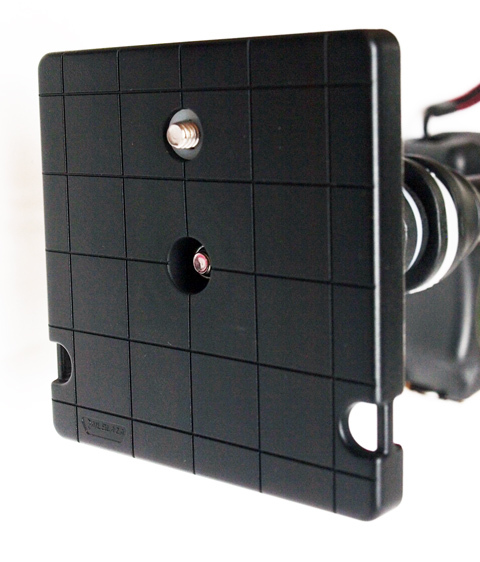 The top platform has a standard camera screw that will accommodate most all cameras. I use the SJ4000wifi and it works perfectly. It is removable and can be used as a second shorter platform. It has the star gear that fits all Railblaza bases. As stated above, the top platform is completely removable and doubles as a short camera mount that can be attached on the front of the kayak or where ever you need a shorter, low profile camera mount. it is essentially two different camera mounts in one. If you are using the top platform in a low profile base you can actually use the taller camera boom as a light pole when fishing at night. It offers better visibility due to the height than surface mounts lights. 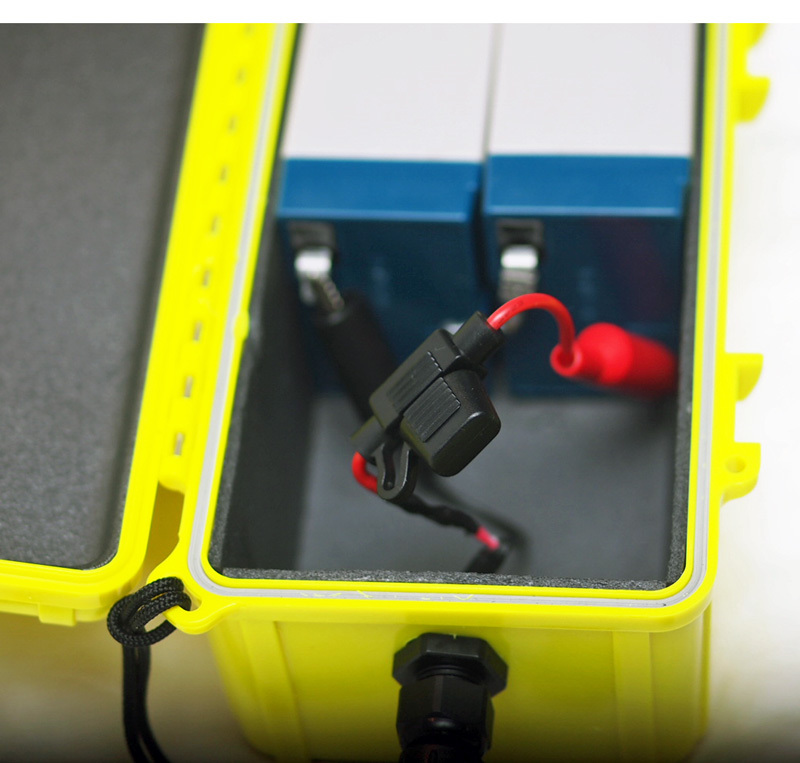 There are 5 different axis points so the boom is completely adjustable to almost any position. 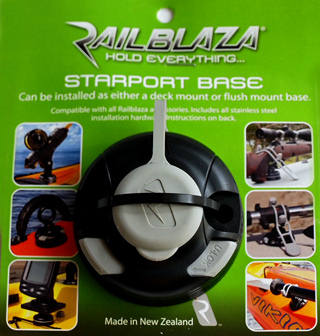 If the Railblaza kayak fishing boom base is mounted on a slope, you can even adjust the boom so it is level with the horizon. Finally, the Railblaza camera boom has some super easy locking mechanisms to make sure you boom stays attached to your kayak. A simple click of the locking mechanism and that is all it takes. The starport bases are designed for "1-click" locking and releasing. 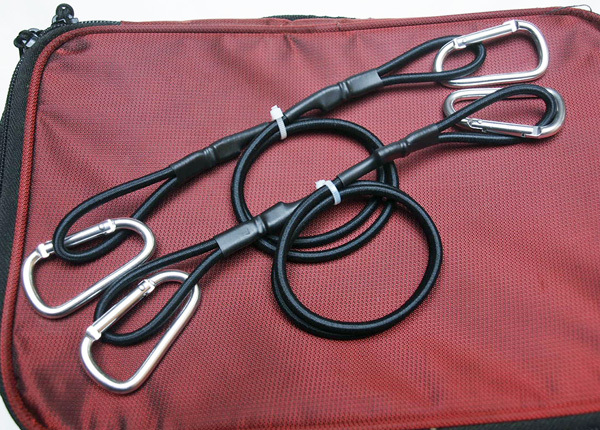 These have a positive locking mechanism that holds the rod holder, camera boom, safety flag, etc. securely in place. You have a choice of either a round Starport or the rectangle "HD" (Heavy Duty) Starport. The round Starport works great in tight locations and has the option to be flush mounted if needed. It has a cap that is included when mounted as a flush mount port. It comes with instructions and hardware. 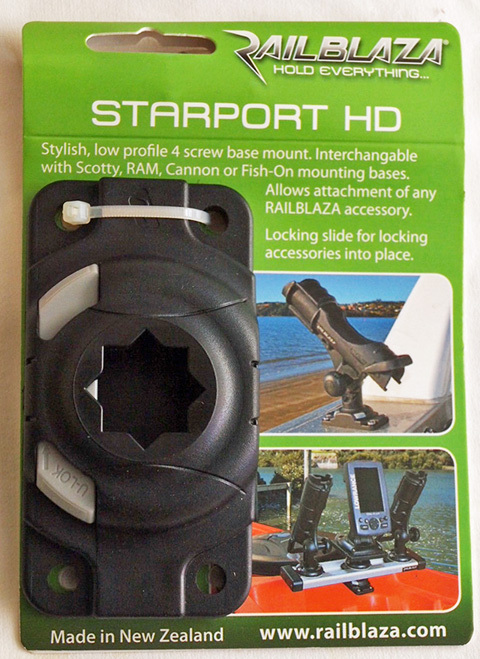 The Rectangle Starport HD attaches with four screws or Tri-Fold Rivets. It is used when more pressure might be placed on the Starport. 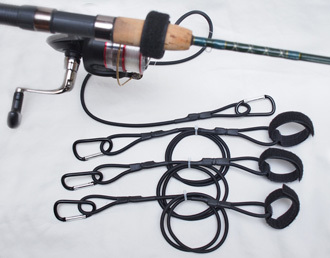 It is great for saltwater rod holders or for heavy trolling, etc. All starports come with hardware and instructions. 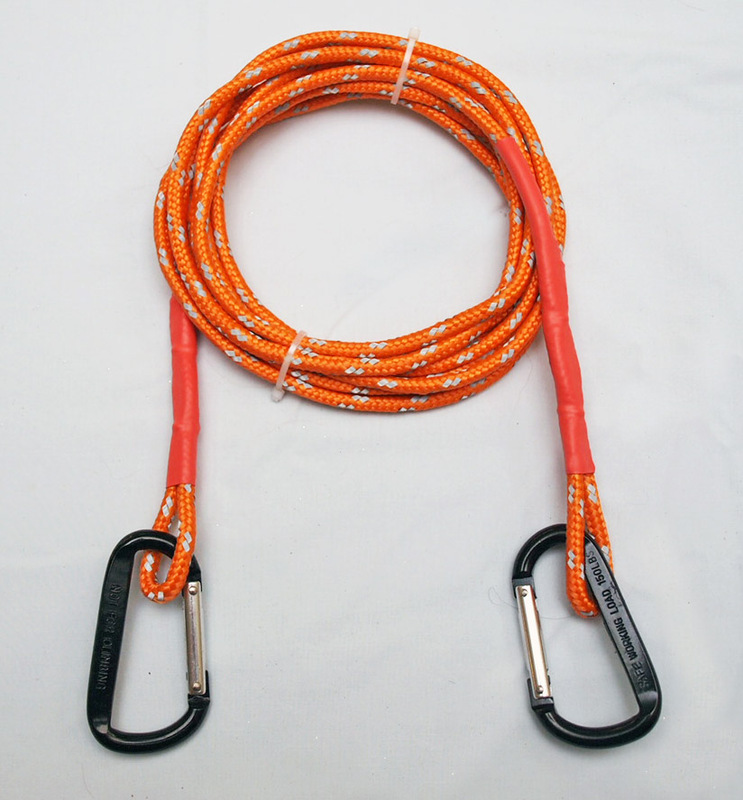 However, just in case you should capsize or forget to lock the base, we have included a free 36" safety leash and a nylon padeye with two tri-fold aluminum rivets. 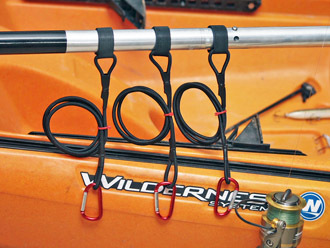 The nylon padeye and rivets allows you to secure your Railblaza boom any where on the kayak. These tri-fold rivets are standard for kayaks and perfectly sized for the padeyes. 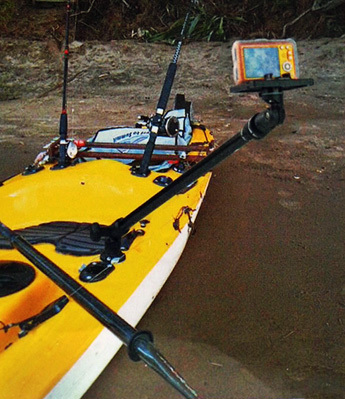 The Railblaza kayak fishing Camera Boom has three leash attachment points. 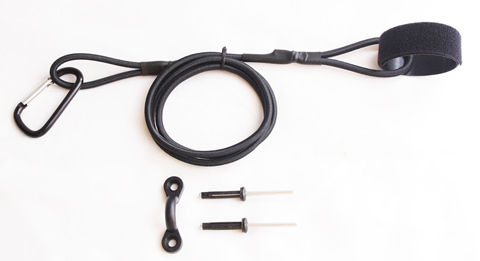 12ft Floating, High Visibility Kayak Tether Leash to Keep Kayak Close when Wading.